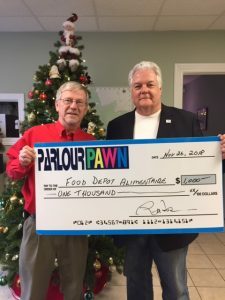 Kicking off it’s Christmas Charity Campaign, shown here is Store Manager Bill Daigle presenting $1000 to FDA BOD President Dale Hicks. This year’s campaign will direct $10000 to local charities. Copyright © 2019 Parlour Pawn.